Ravi picked up his lunch box from the dining table. It was not the regular steel box, he had been using from the past couple of years. This was a taller variety with three polycarbonate boxes stacked one over the other inside a jacket. Most of his office colleagues carried one of these kinds that promise in flashy advertisements, to keep the food warm. He had earlier never thought of buying one for himself, simply because he never saw the need for one. His lunch was never more than two chapptis and some vegetables, sometimes paranthas and achhar or a humble sandwich which comfortably fit inside the steel box. But, of many things that would change in the years to come, marriage brought about this trivial change also, which honestly he was not much worried about. A taller lunch box could only mean a welcome change in his lunch menu; this brought a slight smile on his face, as he picked it up. His was an arranged marriage. The eldest son of a Bihari middle class family, he did not have much of a choice. His father had called him two months prior to the wedding and announced the decision on him. As it always was, he had accepted it meekly, without saying much. The only time he had ever asserted his personal choice was in selecting a course during graduation. He was a Commerce graduate, the first in his family; though there were not many in the family tree that could either claim to be a graduate at all. His father was one. A science graduate of the early nineteen sixties and by that merit had also secured a position in one of the state government agricultural firms. This was no mean feat for his father or the family then, and along with a secure job it also helped his father to the top of the hierarchy of the family decision making matrix. “Offcer beta is never wrong,” the family would believe. His father still held to that axiom though Ravi would, sometimes, want to think otherwise. He had accepted the decision of his marriage and choice of bride with a pinch of salt. Not that he was in love with someone else, but he fathomed the idea. The years of being in Delhi had seeded the wish. His office was abuzz with love stories that he thought befitted the silver screen. There was Dubey and his love marriage, a story made of all ingredients that kept Ravi in rapture every time the former narrated it. More than the billet-doux of the story, Ravi would be fascinated with Dubey’s wife, Kriti’s bold and fearless nature. For someone who hailed from a native town in Uttar Pradesh, she had not thought twice before coming to Delhi in the sly to ask Dubey to marry her lest her father married her off to someone else. Ravi was a sucker for such a fearless and care-free spirit and would often dream of a wife like Kriti, sometimes blasphemously fantasising her as his own wife. He had first met Richa on the day of their engagement which was a month before the actual marriage. She was selected and finalised by his father much before he had called Ravi to announce the decision and of the engagement date. His brother had shared her profile and photograph on mail. He remembers checking the mail long after the office hours lest others would catch him checking a girl’s photograph. He wanted to avoid all queries and discussions in the office regarding his marriage, more so because he had not met his bride to be till now. There were two photographs – one full length and the other, a close up. Obviously it was clicked for the occasion at a studio. She was wearing a saree and was decked up with light jewellery. Wheatish complexion, medium frame the full length photograph did not speak much, except that she was directed to appear coy and demure, as an Indian girl would required to be, especially if one is being clicked as a prospect for a marriage. The close up also came off more like a passport photograph, with her eyes trained direct towards the camera. They were kohled and deep brown as much he could make of reading a girl’s eyes. The nose seemed sharp and there was no smile on her lips. That was all he could make off the photographs and he did not spend much time on it then or even later. If he had an opinion, he either wise could not express. The decision was already taken by his father. The only consolation he drew from the profile was that she was doing her graduation in commerce from a local college. Not much ground for similarities, but he liked the subject. It was of his choice. Ravi had shut down his system and left. He would catch the 7.30 yellow line metro from IFFCO to Rajiv Chowk and then finally the Blue Line to Yamuna Bank. His life was a routine between the blue and yellow lines. Accommodation was cheap at Yamuna Bank and he was grateful to the Delhi Metro that made his travel easy to IFFCO Tokio, Gurgaon, where he worked as an accountant to make a living. When he had first met her, Ravi could not exchange much conversation with Richa. It was anyway their engagement and though he would have liked some quiet moments with her, maybe speak to her a little and overcome his own shyness, none of all that happens in such an occasion. All one can manage are smiles and perhaps a word or two while the families are guffawing and exchanging greetings as if they have all known each other for generations. He had spoken to her a few times over the phone after the engagement but those could be written off as mere formalities of courtesy. Before long, they were married and Ravi was back to Delhi with his bride. Perhaps it was his hangover of Dubey’s love story and a mental image of a wife like Kriti that built an ice between him and Richa, so much so that even after they came back to Delhi, he would only have intermittent conversations with her. In the days from his engagement to marriage and then the week in Delhi, he had made an opinion of her – She was shy, not an excellent conversationalist and one of those kinds from his village who spent their whole life treating marriage and husband as a social responsibility. He had taken the extra week off without his father’s knowledge. He had planned it for a honey moon to Rajasthan, but had later settled it for a period of stay in Delhi taking Richa for a sight-seeing of the city. They visited all those places in Delhi synonymous for romantic getaways with a futile attempt to loosen up with each other. At the end of the week, after all the metro rides, eating at the stalls of Delhi Haat, ice-creams at India Gate, walks around Purana Qila, getting harassed by the Eunuchs at Lodhi Garden and shopping at various markets of Delhi, nothing had changed. The lunch box was purchased at one of these visits, at Lajpat Nagar and he would use it for the first time today. He called out to her from the door, “Richa, I am leaving. Keep the doors locked and open only if necessary.” He paused, waiting for her to emerge from the kitchen, where she seemed to be perpetually locked since morning. She came out, wiping her hands against the pallu of her saree and stood in front of him. He looked at her once again, almost a nonchalant reassuring look, maybe expecting that she will change. Her coy nod was the last look he registered as he climbed down the stairs. It was 7:45 am and he had just fifteen minutes to catch the metro. He stopped a cycle rickshaw with a frantic call. “Metro,” he ordered the rickshawalla. Through the bumpy ride out of his lane, he began to take mental notes of a checklist of the things to do. “Hurry,” he goaded the rickshawalla. He made it in time. There was still two minutes before the metro reached the station. Ravi began to run through his check list again. It was almost after three weeks that he was visiting office and he wanted to be sure that everything was in place. He was in midst of his thoughts when the train entered the station. He took a corner seat, once inside. He liked the corner seat. Sometimes he could catch a wink or two leaning against the fibre glass. Today, he began to run through his check list again. “Mr. Gupta’s file,” he thought. He opened his bag and shuffled through the content. After a while he seemed satisfied. Two stations had passed; two more to go before he changed trains at Rajiv Chowk. Of the entire journey, he disliked this part the most. Rajiv Chowk during rush hours was nothing less than a Kumbh Mela. Even the most careful could get lost. He himself was disgusted and lost on the first day of his break journey. Over these three years he still found it difficult. He sighed as the train came to a halt and he made way towards the yellow line to Gurgaon. He got a corner seat once again. “A lucky day,” he chuckled to himself. Once seated, he returned to his train of thoughts. He thought of his office colleagues and their reaction to his marriage. He was glad that none of them had attended his marriage though as a courtesy he had circulated an invitation a few days before leaving, fingers crossed that no one would want to attend the marriage in a far flung village of his state. Now that he was back they would ask him about his wife, his first night, tease him. He had seen all this happen with other colleagues never expecting that he would be subjected to the same situation some day. He could not talk much about Richa. He hardly knew her yet. Moreover, she would be nothing what he had thought he would have liked in his wife. Maybe, he could make it all up with imaginary stories about her. “That would not be right,” he heard himself saying almost simultaneously with the automated announcement system announcing that the next station is INA. Richa and he had visited INA market when they were at Delhi Haat. In fact it was also his first visit to the market in all these years in Delhi. They had bought some fruits from the market. He was appalled with the rates but had not expressed it to Richa. The same were available much cheaper in their local market. “Market,” he thought to himself, recalling some items that he had to shop on the way back. She had told him last night that there were some kitchen items required. For a moment he had thought, he could ask her to get it herself, but then refrained from doing so after revisiting the mental image he had made of her. The Metro was passing through the Qutub Minar station. He glanced out of the window to catch a quick glimpse of the Minar. In all these years he had never been inside the premises. Maybe, the coming weekend he would visit it along with Richa. A lady came and occupied the seat next to him. He squeezed himself little more to the glass fixing his eyes to the floor, stealing glances occasionally at her feet. She wore a red paint on her toes. He tried to recollect what colour Richa was wearing in the wedding. He could not. “Does she wear nail paint at all?” he thought. Ravi’s thoughts began to numb as the train kept moving one station to the other. He caught a few winks, before he heard the announcement that the next station was IFFCO chowk. He rustled himself casting a quick glance around. The girl with the red nail paint was gone. There was actually no one beside him. The train was much emptier when it stopped at IFFCO chowk. Ravi got down and made way for the exit. It was 9:20 am. He would reach office on time, as usual. IFFCO Tokio was huge building. An insurance company, the building housed over thousand employees. Ravi’s department was in the ninth floor. As the lift made its way up, he began a quick run through of his things to do at office. He was having a feeling he was forgetting something even as he came out of the lift and entered his office he could not figure out what. Lost in his thoughts he made way to his desk and was greeted by the peon. “Welcome Sir,” the peon saluted him with a broad smile on his face. Ravi smiled back. Once at his desk, his colleagues started to throng around him one after the other. “Congrats, bhai”, “So how was it?”, “Where was the honey-moon?” questions and greetings came in from one and all. He smiled and replied to a few, accepting the greetings warmly. It would be only a short while before everything would settle down. And so it did - fifteen minutes after the initial euphoria, office was back to normal. Ravi sighed. He had already begun to get uncomfortable. After a breather, he began to pull out the files from his bag. He meticulously pulled out his stationary, the keys to his cabinet and then rummaged inside the bag to fish out his glasses. 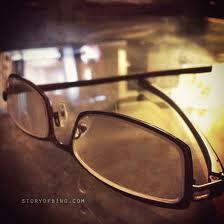 He was long sighted and needed them to read almost anything but to his horror he could not find the pair in his bag. Frantically, he pulled the bag open wide and peered in, but they were not there. He thought for a moment and then struck him what was missing in his check list - his glasses. It must be lying beside their bed where he had left the night before. He cursed himself. No glasses meant no paper work but that is not how his Boss would look at it. In a complete confused state he began to think of excuses. After a moment he thought that it was really not a big issue and he could honestly speak about it to his Boss. “That will be a good idea,” he said to himself and began to walk towards his boss’s cabin. He thought he heard someone calling his name. He turned around to see the peon walking towards him. “Ravi Sir, Ravi Sir – Is your mobile not working?” he asked. “My mobile,” Ravi exclaimed, giving him a surprised look. Fearing that he had left the mobile too, he made a frantic check in his pant pockets. He was relieved to find it. It was on a silent mode and there were some six missed calls, the last being from his office itself a few minutes ago. “Madam?” Ravi blurted taking it as a bolt from the blue. “Who, madam?” he asked the peon. “Sir, your wife,” he replied with the same broad smile on his face. Ravi had already started to walk towards the reception. “Surely it cannot be,” he thought to himself, unsure, confused. “Richa cannot come so far by herself,” he had already started to walk in a faster pace towards the reception. At the reception he looked around. There were some sales agents with their clients but seated on the sofa, in a green salwar suit, it was Richa. She stood up and smiled on seeing him. He could not smile back. He was shocked beyond belief. She held out her hand with his glasses inside the case. “You had left it next to the bed and I knew you cannot read a word without it. So..” she trailed her words trying to register his dazed look and an even more dazed smile at her. There are loads of underlying symbols in the story ranging from about the character to the way a story is read by a reader... One should not miss them. In its plain form of subtle story telling, one has to infuse multiple layers, which have to be peeled by the reader just as an onion would be. In that process, if the emotions that glue that layers are pungent then readers experience a catharsis. In the present age story telling requires the catharsis to be over before one reaches the end of the story - It is the last layer which is important and should be a revelation. While in doing so the author does adhere to the classic principles of Aristotle, yet rather than the obvious stitches that seem to hold the layers, it is the fine stitches that the reader will be led to discover. In this story, can you tell which are the fine stitches? Really nice story & nicely written. The characters are so real and you can actually relate to them. The ending was a bit predictable, but maybe that was because of the title - or maybe its just me. If I were you, I'd probably call it "Offcer beta is never wrong" - I liked that. Just proof read again for a few minor grammatical mistakes and its a great piece of writing. Thanks kim. I will definitely do the proof reading. I should have actually before posting. I like your idea of calling it "Offcer Beta is never wrong" but the "pair of glasses" was supposed to be a metaphor and hence I chose the title. The protagonist's long farsightedness was not limited to reading only, but also in real life, and the irony was that it was to be exorcised by his wife whom he least expected it to. To be honest, I have mixed feelings. I like the layering in the story but then, the ending is so predictable. The far-sightedness too is very easy to guess - also about falling in love. So, I am feeling a bit numb. perhaps, it is just me. I like a bit of dramatisation :) But, I loved the way, u began and gave details - and most importantly, stuck to the story that Indians can relate . Amazing. I accept you POV. In fact after a couple of re reads I do believe I could have added more dramatization. Yet, this was an exercise in writing which I will of course go on polishing with blessings from readers like you. I will post a few more of my flash fictions for you all. Thank you so much for taking time to read the story. simple, yet effective. A lot of times it's very difficult to get that "perfect balance" between user friendliness and visual appeal. I must say you have done a very good job with this. Also, the blog loads extremely quick for me on Safari. Exceptional Blog!